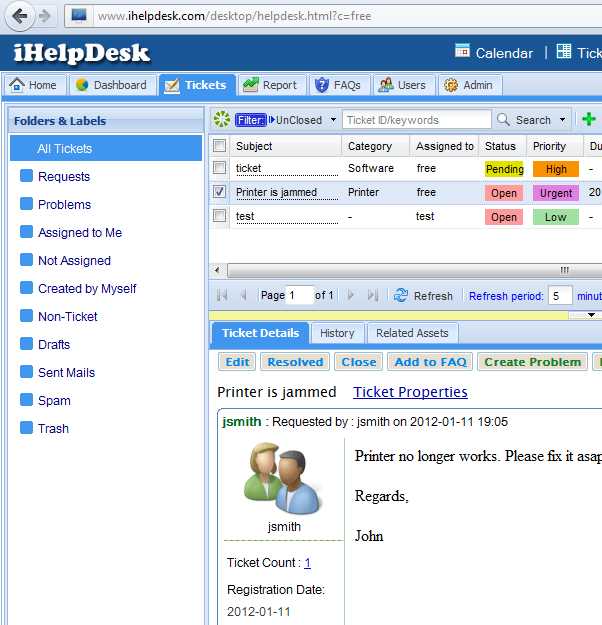 iHelpDesk is a cloud-based help desk service that allows organizations to keep track of issues, reduce manual effort in resolving problems, and improve service quality. Two paid levels ($8, $25 per agent per month) are available. Comments: I'm only demoing it, but after checking out dozens of other highly rated services I'm going to give it a 5 star because the features, visible layout of tickets, clear readability of ticket threads, and color coding high lights make this plat form one of the best I've looked at for the money. Pros: great user interface. highly task focused without a lot of other distractions. color coding of open tasks and viewing of message threads is wonderful. Price is about the lowest on the market. Cons: public customer site is a pretty basic. after working with it for 15 minutes it crashed and I could not login again. sent a request to support desk.